Dragonic Nouvelle Vague is dead and Thing Saver Dragon has killed him. This is the general situation faced by pro cardfighters in Japan; after six months of near-uninterrupted dominance, the competitive favorite evaporated and gave way to a new era of Legion decks. And while Nouvelle's reign had several upsets from the Dragruler-Raging Form cardfighters along with the occasional offbeat build like pre-BT16 Musketeers, it's no understatement to say that the deckbuild was previously one of the most successful in Cardfight!! Vanguard's existing history. The exact mechanics of Nouvelle's defeat are best summarized as speed, cost and consistency. DNV can create a devastating, game-defining turn which involves two vanguard attacks each exceeding 23~28000 power in which the opponent cannot guard with grade 0 units while their defensive trigger checks are canceled out, meaning that if even a single hit from any unit is taken once the defending player is at five damage, they automatically lose with no chance to pull a heal trigger. Due to his high power and Silent Tom-like skill, it is not uncommon to see a player with seven cards in hand be unable to guard because their primary shield comes from 10000-power units. DNV's persona blast can also be a game-winning maneuver in the rare case that playing multiple Calamity Tower Wyverns is not the superior play, and if the opponent somehow survives the initial strike then DNV still has a base 13000 crossride-level defense to fall back on and retains its grade 0-stopping, trigger-cancelling skills for following turns. However, while these skills are some of the most devastating the game has seen, and can be understood as removing the chance aspects of the game without reintroducing an equal level of skill to compensate, they fall short of the bar set by the decks of BT16-on by needing extensive setup. In order to have a properly setup restanding DNV that can win the game when it is put into play, Kagerou cardfighters need to first have Dauntless Drive Dragon ready on the vanguard circle at limit break, a copy of DNV in hand, the opponent needs to be at four or more damage so that the initial DNV attack will be relevant, and because savvy opponents will try to stay at three damage in order to take the first of Nouvelle's attacks this can all take four to six turns to arrange. Meanwhile, the Legion decks of the new format are active on turn three by drawing a single card. Through the normal process of guarding attacks to avoid going to higher damage earlier and card changing out less useful cards, the various builds introduced by BT16 are able to naturally achieve their setup without dedicating to a limit break of any kind. The competition between DNV and these new decks illustrates the unnatural nature of limit break as an artificial and redundant limitation placed on the game in an effort to rebalance it in BT06-on, and it's no surprise that two years after its introduction the first decks to abandon limit break are also the most successful. DNV needs Dauntless, needs limit break, needs to meet sensitive timing conditions and have the opponent in the right position, but the best Legion builds need only draw their intended grade 3 and immediately Seek Mate to trigger their abilities. The whole process is expedited by the presence of Quintet Walls and Luck Bird clones to quickly build up the drop zone for Legion. So while Nouvelle Vague has fallen, why has Thing Saver Dragon risen in its place and not Cat Butler Raizers? To recap a bit, Cat Butler was forecast to be a primary feature of the new format after Bushiroad's celebrity personality Doctor O confirmed over Twitter that its vanguard-standing skill is compatible with a vanguard that is in Legion. Ordinarily Butler only retires itself to stand a grade 2 vanguard whose attack has not hit, but because a vanguard in Legion is considered to be both its grade 2 and grade 3 units, it's valid for Butler's skill. This has built up the new Nova Grappler Legion deck, Ultimate Raizer Mega Flare, into a considerable force to be reckoned with because its Legion skill already gives it an extra critical, and it can restand as many times as there are Cat Butlers to retire while also getting +1 card advantage off of each restand. A Legioned MF can only reach 20000 power unboosted, which in a format of primarily base 11000 vanguards means that its power is not quite on par with DNV's, but its restands come several turns in a row instead of being once per game. The Cat Butler deck has consequently been set up by the western playerbase as a potential best deck in format, with some even rallying around the idea of it being put onto the restricted list or receiving an errata to prevent it from being used with Legion vanguards, but Bushiroad Inc. has shown no signs of supporting these efforts and with the encouragement of Doctor O it appears that their full intention is to celebrate this deckbuilding option rather than try to limit it. Cynically, one could argue that Cat Butler is in fact driving both BT16's sales and clearing out old stocks of EB01: Comic Style Vol. 1, but the tournament results tell a different story. While Cat Butler Raizers has been a major player of the format, as at the Second Beast Deity Cup, Fourth Tachikawa VGCS, Fourth Laketown CS and at the recent YVGCS team tournament where victorious team midcaptain Yuuhi immitated Tatarimetype2's Cat Butler decklist from Tachikawa, it has not been the most dominant or most used deck of the format. Not only have Thing Saver Dragon decks been close at the heels of Cat Butler builds at each of the aforementioned tournaments, but the build has dominated in competition with Narukami's Shotgun Blow Dragon at FR2014 Tokyo, placed first at FR2014 Sapporo and turned up on the first place team of the second Hokusetsu VGCS. Usage numbers from these VGCS tournaments slant towards Seekers, as in the case of Tachikawa's 33 Seeker to 21 Raizer tally, and Cat Butler can hardly be called Thing Saver's lone rival either. Dimension Police's Metalborgs have also accounted for a significant portion of pro play in the new format, drawing their strengths from preventing the opponent from using grade 1 or greater units--including perfect defense cards and Quintet Walls--against the deck's high-power grade 3 Sin Buster. Second place in the Tokyo Victory Cup went to Shibata Takuma with a Sin Buster-Draion deck, while Metalborgs were the third most represented deckbuild at Tachikawa, accounting for 16 players, and making top 8 at FR2014 Sapporo, Tokyo and Fukuoka's open class tournaments. Despite still operating in the constraints of limit break, Bermuda Triangle's PRISM-Duo series from EB10 has been the dark horse deck of the professional season, with the break ride True Sister Mare and self-standing vanguard Duo Temptation Reite as the preferred combination of the year. PRISM-Duo made an early debut in the season prior to Legion of Dragons and Blades' release, placing third at the Second Kansai VGCS and more recently taking first place under the command of Fukuoka regional champion Yamazaki Tatsuya (山崎竜矢) at FR2014 Fukuoka. Further complicating TSD's dominance and Cat Butler's high status, Shotgun Blow Dragon was shaping up as the dominant build of the season prior to BT16 hitting and has continued to prosper in wake of Wild Rush Dragon emerging as a complementary high-power, high-critical vanguard, with Brawlers making top 8 at four of the five Fighter's Road tournaments and accounting for a small portion of each VGCS. So while there is evidence in favor of Thing Saver and Cat Butler Raizers as the dominant decks within Japan, the fragmentation of professional play in light of Nouvelle's perceived lack of viability has caused the lower ranks to be filled with potential competitors, such that the Brawlers, Spike Brothers, Metalborgs, PRISM-Duo and other builds that have received less attention are potentially more dangerous to the most played decks than they are to each other. While some doomsayers are fond of ominously commenting about Legion being "dangerous" for the game, describing it as a "pure plus" or "broken," the reality is that the stark modifications to the pace of individuals games have not changed how professional play behaves on a large scale. The decks with the most potential continue to be those that break the mold and are understood the least. In comparing Thing Saver Dragon and Mega Flare-Cat Butler's value as restanding builds, we need to be mindful of the same characteristics that caused Majesty Lord Blaster to prevail over Perfect Raizer back during Japan's pre-BT06 format. Royal Paladin is a clan which emphasizes conservation through superior calls, needing to put less cards down on average to fill the field than other clans, and in that way preserving the resources in the hand for allocation elsewhere. In TSD this is expressed through File and Gildas; File trades himself into the soul for a Blaster Blade Seeker when the vanguard Seeks Mate, while Gildas performs a flat superior call with the same timing. Since Legion vanguards can generally be flexible with their booster once Legion is activated, File allows easier setup of a rearguard column in exchange for giving up his boost. Gildas helps to complete that column, and the easy access to Blaster Blade Seeker gives Royal Paladin a cheap form of frontrow field control that Raizers lack. Seeker decks also need to draw only a single card to have their self-standing skill active, while Raizers need to draw two, making TSD immediately more consistent than Cat Butler decks. The only time that Royal Paladin will be in-Legion yet unable to use its self-stand is when there are no Thing Saver Dragons remaining in the deck, not enough counterblast or not enough soul, and each of these scenarios is less likely to become reality than not drawing a Cat Butler while in Legion. Cat Butler is also predictable, as the opponent can tell when it can and cannot be used because it must be on the field in order for its skill to be active, whereas they can't always guarantee that you'll play TSD's superior ride when you are able to do so. The card advantage game is an important part in comparing the two decks, because it's clear from how Cat Butler cardfighters are building their decks that keeping up with TSD is a necessary part of the format; the favoritism towards Energy Charger and Street Bouncer in Raizer decks highlights that importance. CBR relies on less stable rearguards with lower base powers and less efficient ways of building the field and advantage over time compared to TSD. However, in establishing this binary dominance of TSD and Cat Butler, pro play has arguably fallen into a creative rut. The release of EB12: Waltz of the Goddess in Japan today is expected to bring at least one major change to the format, with the new Regalia series introducing CEO Yggdrasil, a Legion vanguard who combines high base power (23000 power unboosted) with an additional critical and not being guardable using grade 1 or greater cards. But by contrast, where Yggdrasil forces the opponent to put down a large amount of cards to stop her from almost certainly sending them from four to six damage, or from three to six with a stray trigger, the new Revengers from EB11: Requiem at Dusk have disappointed many. Monthly Bushiroad magazine's revelation that Phantom Blaster "Abyss" can only use its self-standing skill on the turn that it Legions has severely restricted the Revengers' potential in the current format, with many eyes now being on the new Witch cards introduced by EB11. While lacking a restanding vanguard, the Witch series is able to cripple the opponent's field with an entirely new mechanic, calling their triggers from their deck and drop zone over their existing units and then activating supplementary skills based on those triggers being on the field, doing such things as reducing the opposing vanguard's power by -5000 for a turn to effectively power up in the entire field in a “Яeverse” Daiyusha-like fashion, or simply drawing extra cards to build up advantage. Concern should be addressed at the effectiveness of the Regalia units and Witch cards in competitive play; if neither can sufficiently shake up the top brackets, then in absence of a breakout deck from among the aforementioned underdogs the format is likely to remain stale until the rise of VG-BT17: Blazing Perdition in early August. With regards to BT17, the primary concern for the time being is focused on the announcement of a new type of grade 1 in Bushiroad's latest NicoNico Douga live broadcast. Described as a supporting grade 1 that allows the use of limit break while at three or less damage, the unit is expected to revitalize many decks that were outmoded in the emergent Legion format by allowing them to situationally ignore damage limits, as if every grade 3 were designed with a 2011-type format in mind. While the possibilities unleashed by this are numerous, it can be reasonably inferred that this new type of card will be distributed similarly to Quintet Walls during their original debut, and that only clans receiving support in BT17 will initially receive a copy of the new card. Currently this includes Gold Paladin, Link Joker, Kagerou, Royal Paladin, Aqua Force, Granblue, Tachikaze and Narukami as potential targets for the new limit break support. As this only extends to limit break 4 units, ultimate break skills like those of "Ω" Glendios and Platina Ezel are exempt from the support. The implications of these clans receiving this form of support are nevertheless severe; at present the most prominent decks of each clan to benefit from it would be Grand Ezel Scissors, Chaos Breaker Dragon, Dragonic Overlord “The Яe-birth,” Ashlei “Яeverse,” Tetra Drive Dragon and Maelsrom “Яeverse,” Nightsnow and Nightmist, Tyrannolegend and Tempest Bolt Dragon. The last of these is particularly notable because with the new grade 1 available, it becomes possible to retaliate effectively against an opponent who is filling the field quickly, calling few rearguards and using Tempest Bolt's counterblast 3 limit break on turn 3 to wipe out the opponent's field, punishing them for reckless attacks. And among the Aqua Force units mentioned, both Maelstrom variations can benefit from the new limit break support because benefits from being able to hit the opponent. Blue Storm Maelstrom's on-hit gives it an overall increase in advantage by two when its attack hits, retiring an opponent's rearguard and drawing a card, while Maelstrom “Яeverse” can reasonably land its extra critical when the opponent is at lower damage before moving in for a similar effect to its predecessor when the opponent begins to guard. While for many decks of 2012-on the new limit break support comes too little too late, those that were already powerful in the first place now have a chance at keeping up with the modern pace of the game. Even the possibility of DNV making a comeback is present, but unlikely because the card is still a grade 4 unit in need of a grade 3 to precede its debut and removing the sensitive timing would not make it any less slow compared to the benefits of running a self-standing Legion or opting for the much simpler “The Яe-birth.” Each clan represented by the setting receiving limit break support is not necessarily guaranteed; in the case of Link Joker this would make it much easier for Chaos Breaker and Glendios' Omega Lock to bring games to a screeching halt until one player decks out first, and depending on how the new Perdition Dragons are designed the limit break support enabling “The Яe-birth” could stand to undermine the reception of the new units. Exactly where professional play is headed in EB12-on is fairy easy to predict. The existing BT16 decks are here to stay, while Yggdrassil and perhaps Fianna are to join them. The bigger overarching question is how much one card can redeem two years of limit breaks and how relevant the old material will be in the present format. None of the most played decks of the format shut down the opponent in the same way that Nouvelle Vague did, which leaves more room for a response and gives more of a role to the less played builds. The relative stability of the competition at the moment is liable to break down into a more of a free-for-all as the pace of limit break decks develop around staying closer to the same damage as Legion builds, disrupting the certainty that TSD and CBR have brought with them as alternative decks become more viable over time. One of the domineering aspects of the format though is that not every clan will immediately have access to these limit break enabling cards. The Revengers in particular are unlikely to experience a revival without promo card support, despite being major players since BT12, while Great Nature, Angel Feather, Oracle Think Tank, Murakumo, Nubatama, Pale Moon and Megacolony are each left without an easy option to stay relevant in an increasingly midgame-centric format. Over the past three years the research methods, style of presentation and integrity of Cardfight Pro as a publication have undergone dramatic transformative revisions that stretch the limits of what can be defined as a web log. Although statements have been made in the past regarding the general direction and purpose of Cardfight Pro as an organization, there has never before been a single defining document which outlines the goals, methods and ethics it answers to. In light of recent events, it is the view of the head editor that such a document, testifying the will of the organization and the responsibilities of its editors, is called for. Cardfight Pro maintains that it is not in fact a blog, but is a journalistic resource of integrity that is also hosted on Blogger and makes use of its features. It is generally recognized as a reputable source by the global community of cardfighters, and handles a certain responsibility of disseminating information about the progression of the game across the world, with special attention given to professional play. In absence of other uncensored and unbiased publications independent of Bushiroad Inc. and its related companies, the weight of that responsibility to report professionally and in a trustworthy manner to the general public is severe. We recognize a special right of the public to be informed and a right of the individual to inform. Even when the truth is painful, it must be pursued. That is not just the right of journalists, but our obligation to the next generation; the community of cardfighters owe to its successors an explanation of why and how we can come to do terrible things. When a chance at absolute truth is present, it must be taken. This process of handing information down among generations of people is a defining feature of human cognition, and through it the praxis of journalism may be considered a form of fuller humanization of those involved. We recognize that truth and transparency will beget deeper understanding of one another. Websites hosted by Blogger and their associated writers are not presently afforded the protection of state-specific shield laws within the United States of America unless sufficient professionalism is demonstrated; what constitutes professionalism is not clearly established, and there is no nationwide recognition of bloggers as journalists. This much we acknowledge. However, the Society of Professional Journalists' Code of Ethics defines and provides guidelines for the field of journalism as a practice. Journalism is a self-recognizing field wherein a journalist is defined by their recognition among other journalists. Academic degrees, the presence of a publisher or the titles associated with any particular company position are irrelevant in this matter. A journalist is made when journalism is practiced, when the truth is pursued through conscientious reporting and voice is given to the voiceless. Those who act according to the Code of Ethics are journalists, and any individual can be a journalist with or without a publication; to arbitrarily restrict that privilege based on the possession of a print platform is to be counter to the very principles of the field and to obstruct free speech. With or without recognition as a journalistic resource, Cardfight Pro recognizes and abides by the SPJ Code of Ethics to the best of its journalists' abilities. The full scope of the SPJ is available online, but the premises of it and how they affect Cardfight Pro are outlined below in a condensed list. Due to the nature of the Code, it is not and cannot be made legally binding. The Code transcends all legal systems and extends as an international master work of ethics under which each journalist is to interpret independently. Failure to comply with the Code has no legal ramifications, but due to the trust-based nature of journalism it is impossible to work in the field without observing it, as job security, the reliability and bartering of information, promises to sources, and guarantees of anonymity all rely on observance of the Code. -Publish information only if it has been validated to the best of our ability, and believed to be reliable. Rumor and hearsay will be clearly labeled or not published at all. -Pursue both the objective and humane realities surrounding current and past events, providing an opportunity for dialogue among the public on key issues and for individuals to be represented. -Identify sources where possible, and protect those sources who must be protected. -Not falsify or distort the facts. -Avoid advertorial and subservience to corporate interests. Uninhibited advertorial will never be permissible on Cardfight Pro, and private interest will never write or buy the news. -Question the motives of companies as much as those of private individuals are, and never become slaves to hit count. -Promote transparency between all parties. -Seek and fight for the truth even where it is unpopular to do so. -Break stereotypes and promote understanding of subjects as people, accepting views in conflict with those of the editors. -Treat victims with compassion and tact. -Not report harmfully, except where both necessary and unavoidable. -Weigh carefully the public right to information and the right of private individuals to privacy, and act in balance to these principles. Kindness, empathy, ruthlessness and antipathy are tools; these qualities should not obstruct the truth, but assist it. In like, advertisers and sponsorship are necessary evils which support journalism, but are never pillars of it. If it does not support the pursuit of an objective and humane truth, it has no place in Cardfight Pro. -To uphold the ideals of Akira Ito in cultivating a safe environment for both children and adults to play, compete and interact together. -To promote and support a professional community of cardfighters in cultivating their careers with integrity and dignity around the world. -To pursue the truth as it is owed to the public, even at the risk of personal endangerment. In informing the public on the actions of pros, we recognize that even casual fighters that play for fun can learn and use the techniques developed in the course of professional Cardfight. We also duly recognize the potential conflict of interests between the company and the community, the internal elements of Bushiroad, the visionaries and technicians, and between the fundamental artistic pursuits of what the game should be as envisioned by its many authors versus the practical reality of how it is implemented and is under the established system. Where Ito and Bushiroad conflict, it is our choice to side with Ito. Therefore, our first loyalty is to Akira Ito and the art of the game and our second loyalty is to the player base. Nowhere within this does Bushiroad Inc. nor any other corporate body have direct influence or control over the publication. The actions of Cardfight Pro International as a journalistic body must always be in harmony with these ideals. The betterment of the community, the individual growth of veteran cardfighters as well as newcomers, and the artistic vision of Ito must each be respected by CFPro as an organization. Whosoever holds the chair of head editor must never compromise one principle for the other, nor attempt to subvert these ideals for his or her own personal gain, nor yield to attacks on these ideals. Cardfight!! Vanguard is a game which brings people together; and Cardfight Pro should do the same. Four Japanese TCG news resource and advertiser Duel Portal leaked the first visuals for the seventeenth main booster set, VG-BT17: Blazing Perdition. Set to feature cards for the Gold Paladin, Link Joker, Kagerou, Royal Paladin, Aqua Force, Granblue, Tachikaze and Narukami clans, BT17 will feature double the number of Legion Rares of the previous sets, with LR prints for the new Legion pairs "Perdition Dragon, Vortex Dragonewt" (煉獄竜 ボーテックス・ドラゴニュート Rengokuryuu Bootekkusu Doragonyuuto) paired to "Perdition Dragon, Whirlwind Dragon" (煉獄竜 ワールウインド・ドラゴン Rengokuryuu Waaruuindo Doragon) and "Bluish Flames Liberator Prominence Core" (青き炎の解放者 プロミネンスコア Aokihonoo no Riberetaa Purominensu Koa) paired to "Liberator of Oath Aglovale" (誓いの解放者 アグロヴァル Chikai no Riberetaa Agurovaru.) The set announcement comes in the aftermath of series protagonist Kai Toshiki's Blaster Blade Seeker being stolen during the Sunday morning episode of Cardfight!! 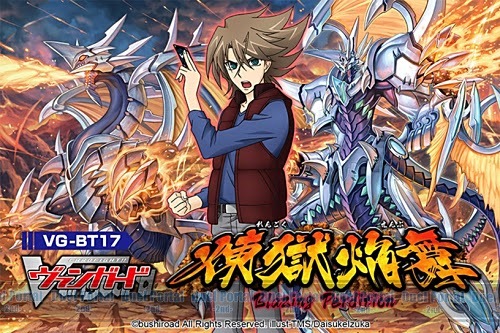 Vanguard Legion Mate, prompting speculation that Kai will be going back to his Kagerou deck to wield the new Perdition Dragon units in BT17. The set's cover cards are illustrated by Daisuke Izuka, well known for his work on the Garmore series of units, as well as Chaos Breaker Dragon and the Revenger, Raging Form Dragon. The choice of Vortex Dragon as the namesake of a new Kagerou Legion is unsurprising, given the card's history; according to the draft papers included in volume 1 of the Cardfight!! 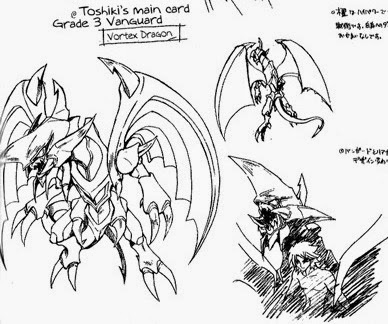 Vanguard manga, Vortex Dragon was originally going to be Kai's main grade 3. BT17's accompanying Gold Paladin support is to feature a second grade 3 able to Legion with Aglovale, who was previously revealed as being part of a Legion pair with VG-TD16: Liberator of the Bluish Flames' boss card, Percival. Aglovale draws his origins from a minor Knight of the Round Table, Sir Agloval de Galis, who in Arthurian legend is brother to Percival and Lamorak, and the eldest son of Pellinore. BT17 will be released in Japan on August 8th, 2014. In other news, the release of volume 2 of the Cardfight!! Vanguard manga is drawing nearer, set to go out on June 24th, and is up for preorder on Amazon. 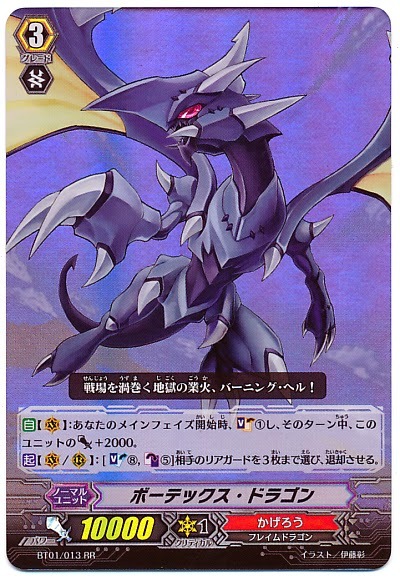 This volume will include the promo card PR-0059EN Dragonic Overlord, believed to be the alternate artwork variant by Studio TMS which was distributed in Japan with the video game Ride to Victory! The manga launched in English just over a month ago under the auspices of publisher Vertical Inc. Vertical's translation has been well-received by fans, and volume 3 is expected follow in August.